I wonder, over the past 50 years, how many people have eaten pancakes made using the Dairy Book of Home Cookery recipe? How many children scampered home from school eager for tea, excited it was Pancake Day, to be greeted by a perfect pancake booked from this iconic book?. a sweet treat for tea! Why not try it tonight? Sift flour and salt into a bowl. Break in egg. Gradually add half the milk, beating to form a smooth batter. Pour in remaining milk and beat until quite smooth. Lightly brush base of a 20cm (8in) non-stick frying pan with melted butter or oil. Stand over a medium heat. When frying pan and fat are hot, pour in 3 tbsp of batter, tilting pan to cover base. Cook until pancake moves freely, turn and cook until golden. Place onion, garlic, kidney and baked beans, tomatoes and chilli in a saucepan and simmer for 15 minutes. Add green beans and pepper, cook for a further 5 minutes or until mixture is thick. Divide filling between pancakes and fold into triangles. Place in a baking dish in one layer. Sprinkle with cheese and grill until melted. Fold pancakes into fan shapes. Melt butter in a frying pan. Add sugar, lemon and orange rind and liqueur. Bring to the boil. Add pancakes. Warm brandy and pour into frying pan. Set alcohol alight and allow it to flame. Serve pancakes as soon as flames have subsided. The iconic cookbooks latest 50th-anniversary edition is still available to buy. With this simple menu, you can prepare a delicious three-course meal with ease. 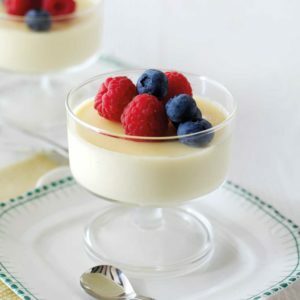 Make the Lemon Posset the night before and pop into the fridge. Cut the Halloumi into thick slices and place in a non-metallic dish. Mix together the oil, lime juice and garlic, season with plenty of pepper and pour over the Halloumi. Turn the cheese so it is coated in the marinade. Cover and chill for 10 minutes to allow the flavours to infuse. Oil, then heat a griddle pan over a medium heat. Remove the Halloumi from the marinade, reserving the garlic oil mix, and cook on the hot griddle until golden on both sides. 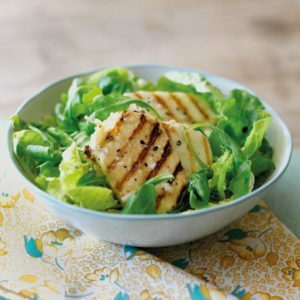 The Halloumi will brown quickly and only needs 1–2 minutes on each side. Arrange the wild rocket and salad leaves in two bowls and top with Halloumi, drizzle with the reserved garlic oil and serve. Tip. There is no need to add salt to the dish as Halloumi is already quite salty. Preheat the grill to hot with the rack about 10cm (4in) away from the heat. Put the pitta breads on a baking sheet and grill on one side, to warm through. Turn them over and spread with the pesto and about two-thirds of the cheese. Tear the ham into a few strips straight over the top. Nestle in the artichoke pieces and tomato halves and sprinkle with the rest of the cheese. Drizzle a little oil from the jar of artichokes over the pizza. Grill for about 5 minutes until the cheese has melted and browned. Season with pepper and sprinkle with basil leaves, if using. Pour the cream into a saucepan and bring gently to a simmer, stirring occasionally. Add the sugar and stir until dissolved. 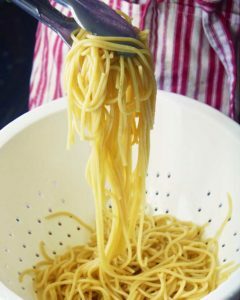 Add the lemon juice and bring to the boil, tasting to check the sweetness – you may wish to add a little more lemon juice or sugar as necessary. Simmer for 2 minutes before removing from the heat. Whisk well and then pour the posset into two heatproof glasses. Leave to cool then chill in the fridge for about 3 hours until set before serving. Top with a few berries if you like. Making something for your lunchbox day-in, day-out can get a little monotonous and it’s easy to get stuck in a rut. lunch and begin to try new things. This week’s Dairy Diary recipe is absolutely perfect! You can make it in advance, chill and then eat when you’re ready. Just take out of the fridge half an hour before lunch to that it’s at room temperature. This recipe is taken from the 2019 Dairy Diary. Still available to purchase if you missed out before Christmas! I’ll be posting lots of lunchbox ideas as well as many other delicious recipes, tips and competitions. Check back next week to find out more. One of the best ways to reduce food waste is to get organised. Obviously, shopping lists are essential, as is buying just what you need. But an organised fridge is important too as it means that can easily find what’s in there and use up what you have. Remove everything from your fridge and throw away anything mouldy or that’s past its use-by date. Wipe inside with a solution of water and vinegar with a few drops of your favourite essential oil (I like lemon or peppermint). Move shelves up/down to make best use if the space. Add a few clear dishes or plastic tubs, which best fit your fridge. A Lazy Susan is great for jars! Decant food from bulky packaging and re-stock the fridge. Ensure that raw meat is at the bottom and cooked meat is stored above it and stack with the earliest use-by date on the top. One of my favourite ‘fridge’ recipes is below. 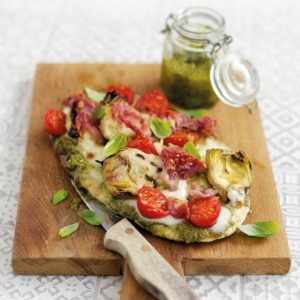 It’s ideal to adapt and use up any leftover veg, fish or meat.